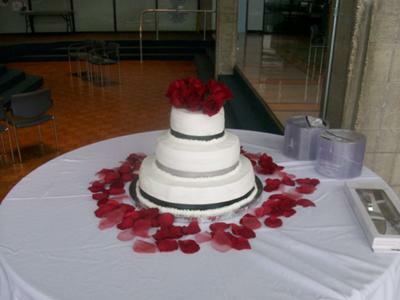 I received a call from a frantic bride on Sunday the week of Valentines Day, requesting a three tier, red velvet wedding cake with roses and satin ribbons for her wedding on Saturday Valentine's Day. The cake was made of red velvet and filled and frosted with buttercreme. The bride opted not to choose the cream cheese frosting. I threw in the roses as a wedding present. I chose to deliver the cake already stacked together, something I rarely do. I had to drive an hour. My heart was beating fast all the way. I never met the bride but I did meet the groom when I delivered the cake. He was very pleased and the cake was delivered in one peace. Oh how BRAVE YOU ARE!